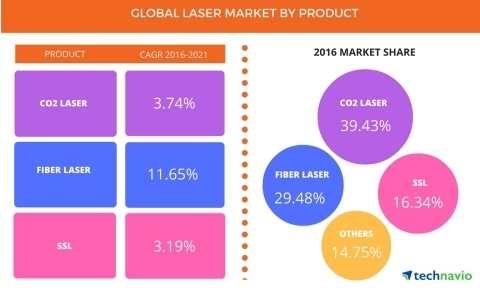 According to the latest study released by Technavio, the global laser market is expected to grow at a CAGR of almost 6% during the forecast period. This research report titled ‘Global Laser Market 2017-2021’ provides an in-depth analysis of the market in terms of revenue and emerging market trends. This market research report also includes up to date analysis and forecasts for various market segments and all geographical regions. Global laser market is expected to grow to USD 6.53 billion by 2021, where APAC will help generate maximum revenue. More than 55% of the incremental growth will be from APAC, driven by the semiconductor foundries, fabless semiconductor companies, and consumer electronic device manufacturers set up there. One of the key driving factors of the laser market is the increasing optical fiber communication network connections. Optical fibers are flexible, thin, susceptible to electromagnetic interference, and are durable, which makes them ideal for use in remote environments, from underground ducts to overhead electricity lines. These characteristics of optical fibers are driving for its adoption in industries such as aerospace and defense, mining, oil and gas, telecommunication, transportation, and utilities to build their communication network infrastructure using fiber optics. “CO₂ lasers are widely preferred due to their low cost per watt and good beam quality. They are available with a wide range of average output powers, which makes them suitable for several applications like cutting, metal welding, and marking. The high absorption of their infrared radiation by materials such as cloth, ceramics, glass, oxides, paper, plastics, and stones make it easy for end-users in the marking of products with date of manufacture and expiration and serial numbers,” says Navin Rajendra, one of the lead analysts at Technavio for embedded systems research. The miniaturization of electronic devices is also driving the demand for low-power lasers for drilling holes in printed circuit boards (PCBS), where manufacturers are increasingly using CO₂ lasers for generating the electrical connection between the layers in a multilayer circuit board. High-power CO₂ lasers are extensively employed in the manufacturing sector such as the automotive industry for cutting, drilling, and welding ferrous and non-ferrous metals. The global fiber laser market is expected to grow at a CAGR of 11.65% during the forecast period, with several companies introducing fiber lasers in their production line. Their popularity is driven by their ability to produce a minuscule focal diameter, resulting in high beam intensity up to 100 times more than that of CO₂ lasers with the same emitted average power. They also offer end-users low price per watt, low power consumption, and minimum maintenance with the high-beam quality, and are best suited for cutting aluminum and copper alloys with high processing speeds at a low cost. “Additionally, many technological advances are being made in the fiber laser, which is leading to the development of technologically advanced fiber lasers. These are capable of cutting metal even beyond 5 mm thickness and can be used in applications that require a pulse of high-peak laser energy, such as for welding, cutting, and drilling, with the added ability to operate in the continuous mode. These developments in fiber laser will increase the market share of fiber lasers during the forecast period,” says Navin. Solid-state laser (SSL) use pump diodes, which have a lifespan of over 1200 hours. This segment held more than 16% of the market share is 2016, with major demand from the healthcare sector. SSL is used in many surgical procedures such as for skin rejuvenation. Neodymium-doped yttrium aluminum garnet solid-state lasers also find utility in general surgery and ophthalmology, where they are used for cutting tissues, while ruby solid-state lasers are used in plastic surgery and dermatology. Become a Technavio Insights member and access all three of these reports for a fraction of their original cost. As a Technavio Insights member, you will have immediate access to new reports as they’re published in addition to all 6,000+ existing reports covering segments like displays, lighting, and sensors. This subscription nets you thousands in savings, while staying connected to Technavio’s constant transforming research library, helping you make informed business decisions more efficiently.